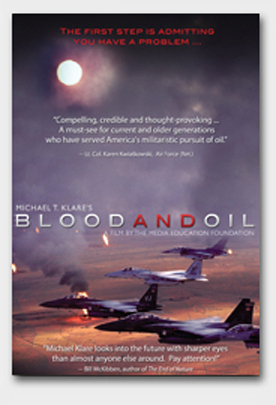 In the end, the film calls for a radical re-thinking of US energy policy, warning that unless we change direction, we stand to be drawn into one oil war after another as the global hunt for diminishing world petroleum supplies accelerates. Michael T. Klare, one of the world's most renowned experts on energy and security issues, is the Five College Professor of Peace and World Security Studies (a joint appointment at Amherst, Hampshire, Mount Holyoke, and Smith Colleges and the University of Massachusetts at Amherst) and Director of the Five College Program in Peace and World Security Studies (PAWSS), positions he has held since 1985. He is the author of thirteen books, including, most recently Rising Powers, Shrinking Planet: The New Geopolitics of Energy (Metropolitan Books, 2008), Blood and Oil: The Dangers and Consequences of America's Growing Dependency on Imported PetroleumResource Wars: The New Landscape of Global Conflict (Metropolitan Books, 2001).